Peppermint, eucalyptus oil, common juniper oil, limonene, caraway oil, fennel oil, linalool and vitamin E.
Insert the tip of the inhaler gently into your nostril, close the other nostril and inhale deeply. Repeat with the other nostril. You can use this product 3 to 4 times daily. This product is not suitable for children under 6. Not suitable for children under the age of 6, or those who are allergic to any of the ingredients. 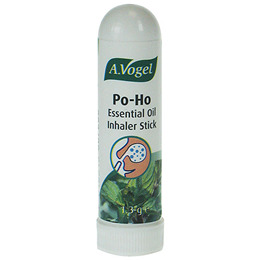 Below are reviews of A Vogel Po-Ho Essential Oil Nasal Inhaler Stick - 1.3g by bodykind customers. If you have tried this product we'd love to hear what you think so please leave a review. Arrived just in time for my winter cold! It was excellent. Good quality, better than you can buy in high street. Very happy that i can breathe!